Actraiser was released on the SNES on November 1991. It is a very unique game. It’s equal parts side-scroller and city simulation. The best way to describe it is Super Castlevania IV meets Sim City. Unfortunately, the sidescrolling sections aren’t as good as Super Castlevania IV’s and the Sim sections aren’t as good as Sim City’s. However, this is a weird game in that the sums of the part are greater than the whole. This weird combination of genres actually makes the game more endearing to most people who play it, and is considered a classic by many gamers, myself included. Generations ago, the world fell into deep Chaos. The Master had maintained the world in a state of peace and harmony. However, an evil one called Tanzra began to threaten its very existence. People spent their lives manifesting their love to their Master while fearing The Evil One. The Master and The Evil One were eternal enemies. In strength and power they were almost equals. Even though the world has fallen into Chaos, somehow the earth continued on its revolving course. These were the only aims of The Evil One. To conquer the world was his only desire. However, The Evil One was unable to destroy the Master. He ordered his six Guardians, who had enormous strength, to defeat the Master and conquer his world. Even though the world was still in a state of peace, the balance of power began to gradually sway towards darkness. One day, The Evil One and his Guardians suddenly appeared at the outer gates of the Sky Palace. The Master, who understood the real purpose of their presence, fought with great courage and little regard for his own life. The battle waged on for many days. The Master was so badly injured that he fled to the safety of his Sky Palace. With the little energy he had left, he erected a barricade. To heal his serious wound, he fell into a long and deep sleep. While in a deep sleep, the presence of the Master's power vanished. With no one to inspire resistance, the forces of Evil invaded the world and did as they pleased. With little hope for any support from their Master, the people had little choice but to be transformed into monsters. The Evil One divided the world into six lands and turned over the control of each region to his Guardians. The world was completely ruined. Stone statues the people had made in honor of their Master became the only remaining evidence of a strong and thriving society. Several hundred years after the world had fallen into The Evil One's power, the Master, who had long since retreated to the safety of the Sky Palace, began to stir. Even though time had completely healed the Master's wounds, his power disappeared when the last of his loyal subjects succumbed to the forces of evil. He found his once ideal world and loyal subjects now overrun by evil. This caused the Master much grief and sorrow, but what could he do? He had no power. Inspired by the faintest of hope, the Master resolved to battle The Evil One so that peace and order might once again prevail. With the final preparations, the Master took down the barrier protecting the Sky Palace and silently began his mission to destroy the Evil One's hold on his earth. The graphics in Actraiser are good but nothing special. The backgrounds look great but most are very static. Enemy design is pretty boring, too. You’ll fight crows, lizard men, dwarves who throw rocks, and even a bird that looks like Elvis. Some of the bosses look cool, though. Some of the standouts are an Ice Dragon and a cool looking Minotaur. Other than that, the Side-Scrolling Stages are pretty bland. The Sim stages look even blander. You’ll see trees, rivers, houses, shrines, some monsters here and there, ice, sand, etc. Don’t get me wrong, the areas you “colonize” are pretty varied, but they just aren’t that interesting looking. There is some cool use of the Mode 7 effect in this game, however. Each time you enter a side scrolling stage, you dive in first person mode from your Sky Palace into the enemy infested area. As you’re doing this, the world spins around, in pretty cool fashion. It’s nothing too extravagant today but, back then, this was awesome. How he never got dizzy is beyond me. The music in this game is excellent. From the title screen onward, you’ll know you’re in for an aural delight. In fact, the music is the best part of the game. Some of the best tracks include: Fillmore Act-1, Fillmore Act-2, Bloodpool Act-1 & 2, and Northwall Act-2. Not all tracks are winners, unfortunately. In fact, the Sim music can get boring and repetitive fast. Also, there’s not much musical variety. A lot of the tracks are repeated throughout the game. The sound effects in Actraiser are very good too. Whenever you swing your sword it makes a sort of noise like a human exhaling. It’s pretty cool. And whenever your sword hit’s something metal, like a spear, it gives off a satisfying clang. Also, when the Master gets hit, he grunts in pain. Interestingly enough, the game is rather quiet in the Side-Scrolling stages. If you’re not making any noise, all you will hear is music. The monsters and environments themselves don’t produce many sound effects so there’s not much ambience to the game, unlike Super Castlevania IV. There are two different modes of play in Actraiser and each area follows the same formula: one action stage, followed by a sim-stage, followed by another action stage. The Action Stages are side-Scrollers in the vein of Super Castlevania IV. You control the Master, who himself is controlling a statue made in his image, in order to defeat the monsters. Once you inhabit the statue you can use your sword to defeat enemies. Unlike in Super Castlevania IV, you can only swing your sword forward or forward when ducking. You can also jump straight up or forward and you have a limited ability to control your momentum. Finally, you can also use magic attacks that you gain during the sim stages such as fireballs and aura beams. There are also powerups you can gain by destroying statues such as apples (replenish health), 1ups, scrolls (give you more MP), and points (gain more lives with points). And you thought I was kidding about the Elvis bird earlier. •	Napper Bats: Kidnap your followers. •	Blue Dragons: Destroy houses (killing people) with lightning. •	Red Demons: Dry up your crops. •	Giant Skulls: Cause earthquakes that destroy tier 1 and 2 houses. Your naked angel buddy fighting a Napper Bat and a Blue Dragon. Going back to your followers, your level grows as your population grows. So does your HP. The construction of towns has three stages of houses. The higher the stage, the more people can live in a house. At the highest level, the houses are impervious to earthquakes. Your followers talk to you, give you offerings, or ask for help. Some of these offerings can be used by the Cherub (Strength of Angel), the Master in action stages (Stardust), or by other towns (Compass). Your townspeople have discovered a strange object which they present to you. After you beat the game once, you unlock Professional Mode. You can access it by pressing down twice on the title screen. The game is harder (this is the original Japanese difficulty), you can’t use magic, and there are no sim stages. The bosses are not that hard after you know their patterns, however. Some of them, like the Minotaur, you just have to outlast. Like I said in my introduction, Actraiser is a very unique game. If the side-scrolling and sim elements were released as separate games, no one would remember either one. The side-scrolling stages are not as good as those in Super Castlevania IV and the sim-stages are nowhere near as deep as Sim City on the SNES. However, marrying these two disparate genres has somehow made two average games into a much better one, and one of my favorite SNES games of all time. Trivia: Some believe that the game is an allegory for Judeo-Christian monotheism. As the Japanese text for the prequel, ActRaiser 2, reveals, the protagonist's original name was God, and the antagonist is Satan. 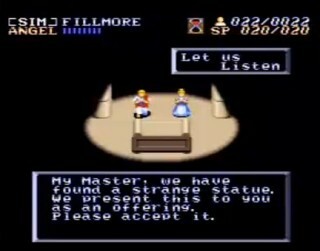 According to Douglas Crockford's Expurgation of Maniac Mansion, Nintendo of America had a strict policy regarding game content in the early 1990s, especially in regards to material which could be deemed offensive, a blanket category which prohibited the inclusion of any overtly religious themes or plotlines in a game. Hence, the main character of the game became "The Master", although the allegory remains obvious, as he travels the globe in a palace on a cloud, accompanied by an angel; slays demons; creates life; performs miracles; and is prayed to by the populace of the world. The second boss of one village in the game is a false god--in actuality a demon with the head of a cobra--to whom the villagers have been praying. The "Master" must invade the unholy temple and kill the false god to restore peace to the village. The allegory becomes much clearer in the final moments of the game, when the Angel and "Master" discover that the churches of the world have become empty, people having lost their concept of faith and need for a deity now that their lives have had all suffering removed. Saddened, but awaiting the day when he might be needed again, the master's sky palace swirls upward into the Heavens and vanishes. Besides the language and the subtext omissions discussed above, there were some drastic changes between the Japanese and other versions. A few graphical and musical changes were made (the original logo typeface being much more stylised, and without the intercap "R"), and the action sections are more difficult in the Japanese version. In the US/NTSC & PAL versions, time flows more quickly in the simulation mode, greatly shorting the amount of time needed to complete the area. This also decreased the number of enemy encounters. 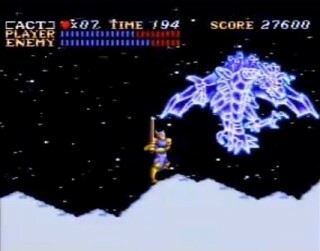 In the US/NTSC version, the Story Mode featured easier battles, while the action-only "Professional" mode (unlocked at finishing Story Mode) contains the Japanese difficulty level. In the PAL release, the Action Mode ("Professional" mode) is available from the menu screen right from the start. Story Mode features three difficulties: Hard (Japanese), Normal (American), and an exclusive Easy mode. A modified version of the game was made for the Nintendo Super System arcade platform. This arcade version featured only the action stages, similar to the "Professional!" mode in the retail version. Among other changes, the game had a different scoring system, and was much more difficult than the retail version: for example, contact with spikes is instantly fatal to the player, instead of merely causing loss of HP. Square Enix made a port of the original ActRaiser for mobile phones, published by Macrospace on September 1, 2004. 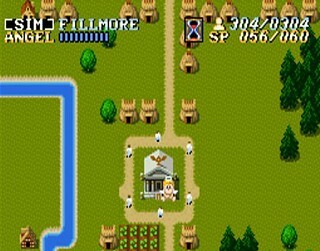 It consists of the first three side-scrolling levels of the game, with the town-building portions completely omitted, and is generally seen as inferior to the original game. ActRaiser also became available on the Wii's Virtual Console. It was released in Japan on March 20, 2007, in Europe on April 13, 2007, and North America on May 28, 2007. As the game was published by Enix, Square Enix currently holds the rights to the Virtual Console edition. An unofficial Japanese-to-English translation has been released for the game which restores the Judeo-Christian references, among other changes. •	Don’t destroy the houses with lightning. Wait until you have Eathquake and come back to level them. •	Take care of the bats and Blue Dragons first. Then build as much of the village as you can before you destroy the last monsters’ lair. •	Don’t give Fillmore wheat. The people from Bloodpool will take care of that themselves if you connect both towns. •	Lead the villagers to their missing man as soon as you can. They will develop the art of music as a result which you can take to Bloodpool to calm the citizens. •	As soon as you gain enough SP to create Earthquakes, go back to Fillmore and Bloodpool and level the towns. Stay a while and watch them build stronger homes which will house more people, increasing your population. Do the same in all towns. •	Build as much as possible before sealing the last monsters’ lair. •	As soon as you get the herbs from Marahna, go back to Kasandora and use the offering. Continue building, if you haven’t finished. •	During Action Stage 1. When you reach the waterfall section, take the high road and collect the powerup there. It will be very useful with the boss of this stage. •	If you can, save up all your Angel Powerups for this stage. They’ll be useful against the Giant Skulls. •	Don’t forget to dry up the lake. •	Don’t bother saving up your MP for the last boss. His vulnerable area is very small and covered most of the time making your magic mostly useless. Instead, use your magic against troublesome bosses in the gauntlet right before the final boss. I always preferred the Sim stages to the Action stages here, and the comparison to Super Castlevania IV is spot on. Carbon copy, almost! This review is packed to the gills! I like the GIF deals! Nice review Sam, and great gifs as always. ActRaiser is one of my favorite SNES games, and I was fortunate enough to experience it firsthand when it was still relatively new. The game exemplified what I knew the SNES was capable of. I've beaten this game many times on my SNES and on Wii VC. I suppose you're right that the graphics may not be anything special, but for an early SNES game I was astonished by the details. There may have been some static backgrounds, but then you had these awesome backgrounds like Aitos, shown in your gif, which had multiple cloud and mountain layers in the background, giving a very convincing sense of depth. Finally, you can also use magic attacks that you gain during the sim stages such as fireballs and aura beams. I would also add that the Sim stages add a stronger incentive for the player since they can listen to the villagers and hear their pleas for help, something I think Guillaume brought up when he discussed the game (and genre mash-ups) in the NW podcast ep. 27. Because of the emphasis on story and character sympathy, you have a greater sense of determination when you head into the action sequences to vanquish evil. The music is wonderful of course. One of my favorite tracks is Northwall Act 1. Actually, I also enjoyed the Sim music a lot, even though you hear it over and over again (I can understand if you called it boring). However, I simply find it soothing as it invokes the feeling a small and quaint village full of people's hopes and dreams. @roykoopa64 Thanks. I chose Aitos for that same reason. It featured not only multilayered backgrounds, but also boring and weird enemy designs at the same time. I also feel that the sim-stages lift up the story in the game because you feel the plight of the villagers on your back as you defeat the bosses. You feel like you're liberating the people and their lands. Great review, sirmastersephiroth! Actraiser was one of my favorite SNES games at the time, and I still have my cartridge and game box somewhere. My mother and I used to play this one together - at her insistence! She would take control during the sim stages, but once the action started... My turn! I liked the sim stages, too, even way back when as a wee child, but she kind of out ranked me. Haha. We had so much fun with this game, that when I asked for Actraiser 2, I had a feeling it'd be a guarantee. And it was! But, sadly a disappointing gift it was. The sim sections were banished and the difficulty revved up a bit too high. Gone was the fun of the first. Suffice it to say, I traded that one in. But the original? It was just what the SNES was all about... Awesome music, and colors that pop! Oh, and I thought I was the only person that said things like, aural delight! @NoName That's pretty cool that you and your mom played together. I'm the only gamer in my family so it's a lonely hobby for me. I did play some MLB with my father at Best Buy this past weekend. We actually had a pretty good time. Back on subject, I've actually never played the sequel to Actraiser. The fact that it didn't have any sim segments just dissuaded me from playing it. This was beyond any doubt in my mind my favorite game when I was younger. This review is fantastic by the way, congratis. I just downloaded this from the wii shop like a month ago, when i saw it on the virtual consul, i think i may have peed a little. one of the best. The connection you form with your followers in the sim segments is amazing unlike anything I've played before. Poor teddy. that kid must have had a terrible childhood. Both videos have been time-stamped to the conversations in question.